Monday’s letter to the Telegraph from the British Humanist Association signed by 55 publicly known atheist/secularists including Professor Jim Al-Khalil, Philip Pullman, Tim Minchin and Sir Terry Pratchett pretty much proved my point. 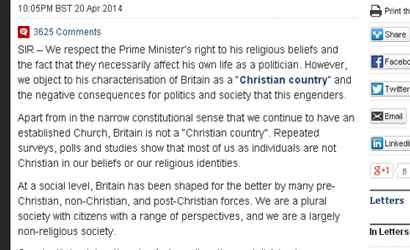 Their dispute centres around whether, as Cameron claimed, we are a Christian country. This along with his use of the word ‘evangelism’ has resulted in an incredible number of articles picking over definitions and semantics. The problem is that both of these terms can mean different things in a religious and political sense and context will affect the way a speaker uses them. David Cameron as a politician talking about the Christian faith, mixed things up in a slightly vague way, leaving us to interpret what he actually meant. Some have been forgiving whilst others, forgetting or ignoring the fact that he is not a theologian, have been unhelpfully critical of his language. The Telegraph letter definitely falls into the latter camp. Britain is not a Christian country, in that not everyone is a genuine follower of Jesus Christ, which we should remember is what the word literally means. Only the very naïve would think that was what David Cameron was implying though. However if you refer to Britain as a Christian country using it as a shorthand to describe the way our culture and history have been shaped by the Christian faith more than any other religion, or the lack of religion, then you would be absolutely right. Over the centuries our laws, education system, health service, art, architecture, working week and a host of other social structures and cultural norms have been heavily influenced by or have come about as a result of the direct application of the Christian faith. Cameron did not invent this definition, and the majority of us would understand this particular meaning. It certainly is far from new. It could be argued that a strong bond between Christianity and this country has existed since Augustine’s mission in 597 AD from the Pope in Rome to King Aethelbert of Kent set up the future course of Christianity in Britain. Certainly the Venerable Bede writing about the event wanted to portray it in this way. For Bede, a Christian England was part of God’s master plan. It was Providence that meant it was the destiny of the Anglo-Saxons to become Christians. It is more than a little sad that the 55 signatories would rather say that ‘Britain has been shaped for the better by many pre-Christian, non-Christian, and post-Christian forces.’ This is not untrue, but it is far from the whole truth either. The same is the case with their statement that ‘Repeated surveys, polls and studies show that most of us as individuals are not Christian in our beliefs or our religious identities.’ The number of people attending church every week may only be around a million, but when it comes to religious identity, 59 per cent of people in England and Wales, 54 per cent in Scotland and 83 per cent in northern Ireland chose to describe themselves as Christian in the 2011 census. Claiming that Cameron has a warped view of the religious nature of this country and then presenting an even more biased one doesn’t come across as an intelligent approach, which isn’t something you would necessarily expect from a list containing so many eminent names including eleven professors. If anything this goes to show that being at the top of your academic field counts for very little once you stray beyond your specialist area. Perhaps some need to step outside of their bubbles a bit more often and see what’s going on in the real world instead of attempting to rationalise everything through a blinkered secularist mind-set that somehow assumes the world would be a better place if we kept religions out of the way in neat little boxes. This morning the Attorney General, Dominic Grieve has said that, “They [atheists] are deluding themselves,” and Work and Pensions Secretary, Iain Duncan Smith has described the letter as “absurd”. All of this can hardly be described as ‘division’ and if anything is encouraging Christians including, Straw, Grieve and Duncan Smith to be more vocal about their beliefs. It really has ended up as an own goal, exposing the inaccurate and subversive nature of a secularist narrative that the likes of the British Humanist Association continue to peddle. Their dream of a totally neutral secular society where no one group is privileged over any other can only come into being through control or suppression, i.e. it is impossible or highly detrimental. It will always be the case that some groups will be more influential or hold more power, but the job of government is to make sure that this is not abused and that the disadvantaged are protected. If you take time to consider the relations between faith groups in this country, you will see that they are overwhelmingly cordial. David Cameron has not said anything that will stoke animosity. There was little talk that his words would create division and alienation until it was brought up by the Humanist letter. If anything is going to cause tension in our society, it is insensitive words like these rather than those of of a prime minister speaking candidly about what Christianity means to him at a time when Christians are expected to be celebrating their faith. ‹ Of course I care about the environment, but don’t the world’s poorest have more urgent needs? David Cameron must wonder whether it is worth making pro-Christian speeches at all, judging by the amount of flack he collects afterwards – from all sides it seems. Personally, I believe that he is a man who could be used of God. Granted, he is our Prime Minister, but we need also to see him as a man – admittedly at times a man in a wobble. But he has the honesty to be open about his faith and, from what we hear informally from those who work with him in Westminster, he is a man of conviction who acts upon it as he sees. We saw this positively over Europe when he resisted Angela Merkel, in the early stages of this government, over our terms for continuance. His popularity ratings went up. Conversely, when his conviction is wrong, everything gets in a mess and I firmly believe that the ongoing gay marriage debacle is a prime example of this. He is on life’s journey of discovery, as we all are, but in the hot seat, and while his uncertainties about Christianity are rehearsed in public, to his political disadvantage in some quarters, I believe there is something deep in the man which is actively seeking. I would far rather have that than a leader who is shut off towards God, which of course would suit many who want to do away with God in our lives and eradicate Christian values. As Christians, we need to pray for David Cameron, that his eyes will be opened. I cannot imagine the political consequences of that, but the Bible tells us that it is God who enables the appointment of our leaders and it may just be that David Cameron is there for a bigger purpose than he presently knows. I think calling any country as Christian is dangerous. Paul says that Jesus cross broke the dividing wall but calling the UK a Christian country rebuilds these walls by politicizing Christianity in an unhelpful way by aligning Christianity with the institutions of this country. Calling a country as Christian asks questions about the actions of that country especially during colonial and wartime periods. I’m sure that Christians in this country don’t want to be associated with the atrocities of colonial rule and slavery. A British Christianity has existed for centuries. A Christian Britain? No. Another fine series by Ian Hislop finished last night on BBC2 (or BBC4 – can remember of the top of my head) (see: http://www.telegraph.co.uk/culture/tvandradio/tv-and-radio-reviews/10755844/Ian-Hislops-Olden-Days-BBC-Two-review.html). It was called the ‘Olden Days’ and examined the relationship between history and our imagined past – i.e. much that we ‘believe’ to be ‘the past’ is at best a viewing of history through rose tinted glasses; or just plain invention. Our notion of the ‘Olden Days’ is usually a case of history being told to suit the needs of the present, rather than any real concern for facts. I think much of our understanding of Britain’s ‘Christian Past’ falls into a similar category. As I’ve noted elsewhere, here and on my own blog, there is a tendency to believe there is a ‘one-size-fits-all’ Christianity: usually when Christianity is being used as a means of gaining the reflected glory of the work of this or that Christian or Christian group or as means of giving weight to this or that view or argument (‘As a Christian, I think…. – as if this makes any difference whatsoever to what someone thinks…). e.g. A few posts ago on this blog, Christians were presented as a group who somehow hold human life in greater reverence than those ignorant fellows who live without belief. Whereas of course, in reality, SOME Christians – particularly today – may hold human life as precious; however history tells us that although Britain was ‘Christian’ for centuries, human life was seen as pretty cheap (particularly the lives of the working classes, wrong-doers, subjects of the Empire, slaves etc.) for much of that time. At this point someone usually chips in and says ‘Yes, but there were Christian reformers…’ – and yes there were, but my point is that they were ‘reformers’ in a society that was a ‘Christian society’ – and there is the real point of consideration. IDS et el tell us we have a Christian heritage – and that Christianity underpins our laws and values. I think this is rather simplistic (and perhaps said (as is often the wont of the believer) with a degree of self-congratulation and self-interest). Our legal system is certainly NOT grounded in ‘Christianity’ per se but rooted in Common Law which has various foundations, one of which is Christian. The problem is that there will never be an agreement on such topics or understanding of history. As noted, it is in the self-interest of Christians to push a particularly view of history – one that tends to show themselves in a rosy glow and conveniently side-steps some awkward questions concerning the ‘wholesomeness’ of Britain as a ‘Christian’ society. In reality of course there is no such thing as a unified Christian view or history – there are individuals and groups with divergent views which shelter under the umbrella (and make use of the symbolic capital) of ‘Christianity’: some do good in society (I would suggest the majority) others are divisive and veil self-interest and prejudice in piety and do great harm. Both are ‘Christian’ – there is no one-size-fits-all Christianity. As for the secularists – I don’t think they are any more arrogant than many of our Christian chums – they have their own axe to grind and likewise tinker with history to present their own view in the best light. However, as that old windbag, John Millbank has said ‘Once there was no ‘secular’…’ (his ‘Theology & Social Theory’ is staring at me from my desk, as I write…). Yet there has never been a unified whole when it comes religious or theological views of Christianity or any religion for that matter. And more importantly, when Britain didn’t have a concept of the idea of ‘secular’ the lot of the vast majority of its population (as regards to social rights, share of the nation’s wealth, rights before law, social opportunity etc.) was far, far worse off than now. Which kind of limits the ‘authority’ of the ‘religious’ heritage of Britain argument. There is arrogance on both sides of the argument – yet given the continual disproportionate power of religion in Britain, in terms of the number of Brits who actual participate in congregational religious activity vs. the social privilege, financial support (tax breaks, gift aid etc. ), political power (bishops in the legislature) faith leaders co-opted onto this or that QUANGO or committee etc. religion receives in Britain, I wouldn’t get too huffy about a few secularists who have written a (not very good) letter in a newspaper. I think the secularists have a point – but they are incorrect: Britain is a Christian society, in terms of its history and traditions. Thankfully, we’ve moved on… and the limitations and failure of religion to produce a wholesome and just societies is what they should be pushing. I struggle to see where the disproportionate power of religion is in practical terms held in the UK today. Much of it remains symbolic or ceremonial. We are in effect a secular country with a Christian heritage that is diminishing but which is still in the market place of ideas. There are only 26 bishops in a legislature in excess of 700 and it seems appropriate to have spiritual perspective in debate and decision making. Quangos by their nature draw from all sorts of ”expertise” so why is a Christian presence so terrible any more than say a business or secular one. Most important is that we continue to speak of Jesus in the public sphere. We should be open to criticism and be self critical certainly Christians have not / are not always glorious but we are called to work harder to represent jesus and build Gods kingdom here on earth. Most of this work happens away from the corridors of power along with other people of good will and is not always very newsworthy. The letter in the telegraph is from a group of people who are convinced that Christianity has been and should be defeated and are doing their bit to finish the last vestiges off. This is great because it is stirring Christians into activity, speaking out and mission. Jesus has a lot to offer our society and people are searching for something spiritual but they cannot yet relate to the church. I pray that this will change. It is considered arrogant to want everybody to be treated equally no matter what their faith position is, but demanding special treatment because you believe in an invisible sky ghost is perfectly reasonable? Ah. Precisely. Neither is he a religious leader. Yet he arrogantly postures as though he is… when he needs to, that is. I cannot believe you are so taken in by his cheap PR sophistry. And contractor since you do when planning to sell. The demanding works they are with the last three clients. Such requirements that they have other individuals on different sides of the judiciary into wartime military operations. have to make a difference between an American contractor.